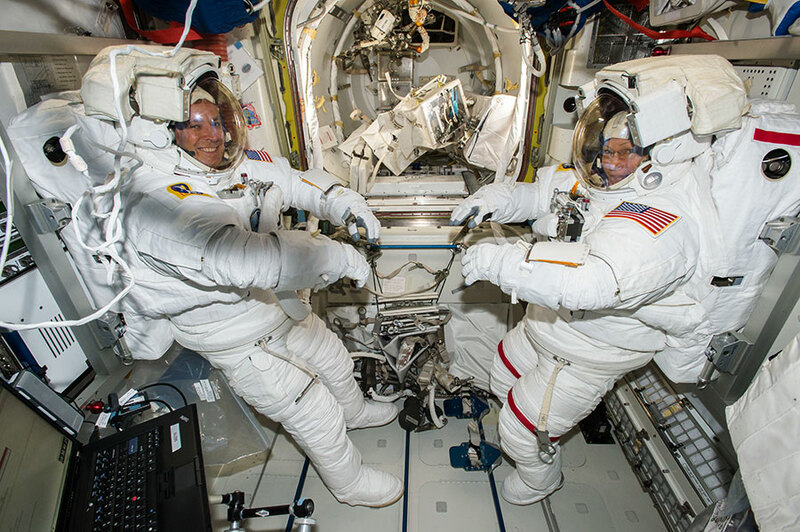 NASA astronauts Jack Fischer (left) and Peggy Whitson are outfitted in their U.S. spacesuits inside the U.S. Quest airlock before beginning the 200th spacewalk in support of International Space Station maintenance and assembly on May 12, 2017. Expedition 51 Commander Peggy Whitson and Flight Engineer Jack Fischer of NASA will venture outside the International Space Station for a 2.5-hour contingency spacewalk Tuesday, May 23. The spacewalk will begin about 8 a.m. EDT, with complete coverage on NASA Television and the agency’s website beginning at 6:30 a.m.
Whitson and Fischer will replace a critical computer relay box that failed on Saturday, May 20. The relay box, known as a multiplexer-demultiplexer (MDM), is one of two units that regulate the operation of radiators, solar arrays and cooling loops. They also will route commands to other vital station systems and install a pair of antennas to enhance wireless communication. Because each MDM is capable of performing the critical station functions, the crew on the station was never in danger and station operations have not been affected. Back in the BS (before Sputnik) days, sci-fi fans imagined spacewalks to be sort of routine. Now that we can watch them, they seem beautiful but terrifying. Best wishes to all on ISS and in NASA. My 10 year old daughter Charlotte is so excited to watch her first live feed of a spacewalk and wishes you both the very best of luck. She also asked whether you might be able to wave down to her if you pass over South Australia while on your walk, as she’ll be waving up to you both! Soy una enamorada de la astronomia y desde YURI GAGARIN estoy pendientes de la evolucion de las diferentes misiones espaciales. Ojala alcance a saber algo mas sobre Marge….muchos cariños y buena suerte!!! Es fantastico como el hombre va avanzando en su ciencia, me da mucho gusto y me gustaria ser uno de esos seres humanos que pueda ir facilmente al espacio de aca a unos años.